Kitty Ferreira is a British Fashion brand that manufactures its garments in the UK and so it should, but it seems that other more established British fashion brands don’t feel obliged to manufacture in their homeland. Brands such as Burberry and Mulberry who market themselves as all British Fashion labels are, as it turns out, not ‘all British’ in their manufacturing practices. The Made in Britain label is a big part of what makes a brand quintessentially British, so how do these British brands justify manufacturing abroad and marketing themselves as British? 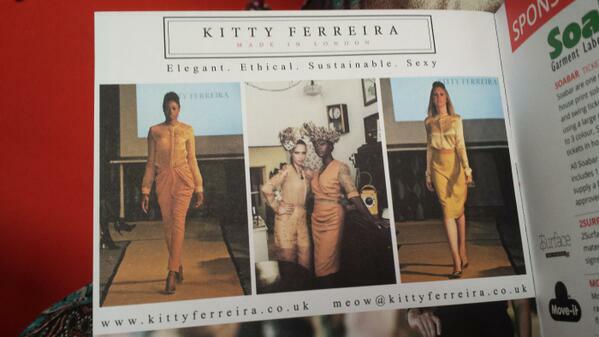 And how do authentic British brands such as Kitty Ferreira compete? Burberry claims that their status as a British brand is firmly rooted in its history as oppose to its current operations. In 2013, Ian Scott, Director of group supply at Mulberry, stated that all of the brand’s men’s bags are made in Turkish factories, while some of its luggage items and small leather goods are manufactured in China; all the while claiming its goods as being made in the Somerset factories the brand setup in 1973. Questions have to be raised about authentic British branding and whether these brands can be considered British in terms of quality and production. Organisations like ‘Make it British’ make a point of organising events that encourage designers, UK manufacturers and buyers to network together. The first ever tradeshow showcasing purely British made products and manufacturing occurred at the ‘Meet the Manufacturer’ event, June 2014. The event covered every aspect of the issues facing the British Manufacturing industry, from production to training, artisanship to quality and bringing production back to Britain. Thankfully the demand for Made in Britain goods is on the up. On October 3rd 2014 another organisation that celebrates British made goods ‘Best of Britannia,’ will be launching their annual ‘Buy British Day.’ Their aim is to focus consumer attention on the amazing quality of the huge range of marvellous products Britain still produces. Kitty Ferreira is well positioned to benefit from this growth in demand for British made goods, but trying to evaluate the brand’s position next to established brands like Burberry is a near impossible task. Due to smaller designers having to produce in small quantities, they can’t realistically compete against the big boys. Are the big brands really saving money by offshoring their productions? Is it better to manufacture in the UK? I suppose the answer to both these questions are yes, but does that mean one is better off than the other in the long run? Well, that remains to be seen, but the Kitty Ferreira brand stands firm in the belief that ‘British Made’ is better for the good of not only the British economy but for firm British Identity on a global scale.